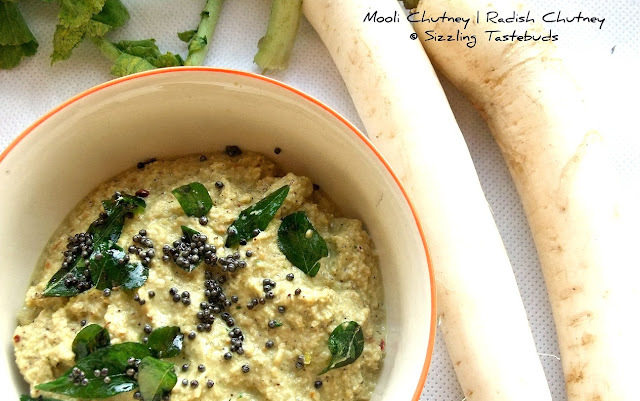 Mooli Chutney (or Radish Chutney) is one of the newest chutneys to add to my menu.. We love our vegetable / fruit based chutneys like Veg Peel Chutney, Apple Chutney, Ginger peanut chutneys to go with Idli / Dosa. This experiment with whole (and grated) radish was a wonderful bitter-sweet chutney which we enjoyed with Set Dosa (lentil & flattened-rice crepes) a lot. Most chutneys or dips in South Indian are coconut-based. However, in my family we do prefer non-coconut based chutneys, especially for breakfast options along with Idli / Dosa. Radish is very good for diabetics and is very healthy too, while providing relief from Jaundice, Piles, Urinary disorders and some skin disorders. Its also on the highly preferred list for weight watchers too, as the water content helps dieters lose weight easily (through salads etc)..Without further ado, lets get to this yummy, spicy chutney using Mooli / Radish. 3) In the same pan, add the remaining oil. Roast the lentils / dals (channa dal & Toor dal), tamarind, chillies (in the same order) till the dals turn slightly brown. 4) Cool and grind the above dal-tamarind-chilly mixture with stir fried radish, salt and jaggery to a slightly coarse consistency using minimal water. 5) Transfer to a serving bowl. Prepare tempering with oil (1 tsp), mustard seeds, curry leaves & asafoetida. 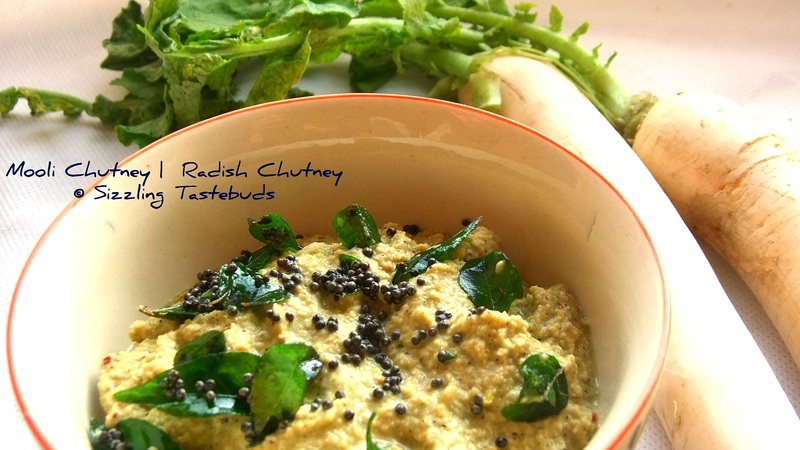 Pour onto chutney and serve with rice / rotis. Even for me this is a new recipe kalyani.Will try this.mooli is something I always love..Nicely made! This is just so new...to all of us I believe!! My grandmom used to make this chutney when we were kids !! But later I did not taste this...Need to try sometime !! Very healthy though!! Very new recipe.......Thanks for sharing. never tried this, guess due to the bitterness.. love the idea of jaggery in it! Naaice! a new accompaniment to my morning idlis! Wow looks great. I love your version as it is without coconut. I made with coconut.